Hello folks! 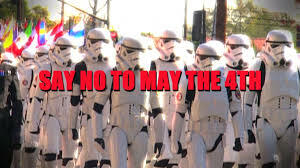 It’s almost that time of year again- the 4th of May. The day that we celebrate our love of Star Wars on National Star Wars Day. Some people will celebrate at home alone with a big tub of popcorn watching the films. Others will celebrate with good friends and good food. Some may have a costume party host a costume party. No matter how you choose to celebrate, one thing is certain: this is a day for Star Wars fun. Typical festivities consist of inviting fellow Star Wars-obsessed friends to stay over, and then watching the series in succession. Lots of snacks, bring lightsabers and Star Wars-themed toys. Lightsaber fights in the early morning hours optional. A special message that reveals the ugly truth about May the 4th, also known as Star Wars Day. Lisa has been an avid gamer since she was old enough to hold her first controller and a game writer for more than a decade. A child of the Nintendo generation, she believes they just don’t make games like they used to but sometimes, they make them even better! While consoles will always be her first love, Lisa spends most of her gaming time on the PC these days- on MMOs and first-person shooters in particular.